Biti told a meeting here Tuesday that the recent reshuffle of positions both in the ruling Zanu-PF and cabinet was a non-event, adding Zimbabweans must look to the youth and progressive elements in the country for a change in the nation's trajectory. President Robert Mugabe last week fired Vice President Joice Mujuru and replaced her with Emmerson Mnangagwa. Biti acknowledged though that "the events in Zanu-PF which elevated Mnangagwa had taken many by surprise." He added that the acerbic succession dispute in Zanu-PF has put a premium on the country. The former finance minister, who is one of the leaders of the United Movement for Democratic Change, took a swipe at Mr. Mugabe, saying the president is displaying dictatorial tendencies like some former late African dictators. On the government of national unity, Biti said its major achievement was bringing Zimbabweans to work together as a team. Despite policy inconsistencies in Zimbabwe, Biti said investors can do business with Harare but not on a short-term basis. On why Zimbabwe was on the agenda of the Centre for Global Development, the center's chief operating officer of the international community, indicated that "we have taken a long interest in Zimbabwe as a very promising country that unfortunately has become a fragile state in many respects; the country had the worst economic collapse in modern times outside of a war." 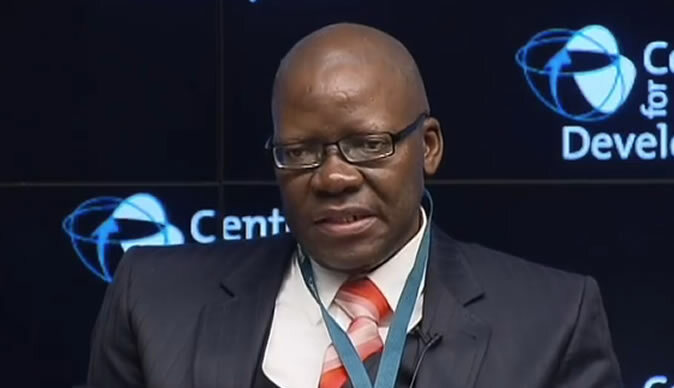 Responding to the issue of sanctions imposed on Harare, Biti said the stick and carrot approach must be used to entice reforms. In 2001, the United States imposed targeted sanctions on the government of Zimbabwe, including restrictions on U.S support for multilateral financing, financial sanctions against selected individuals and entities, travel sanctions against selected individuals, a ban on transfers of defense items and services, and a suspension of non-humanitarian government-to-government assistance citing rights abuses and rigged polls. Despite strained political relations between Washington and Harare, the United States is a leading provider of humanitarian assistance to the people of Zimbabwe through food aid and other necessities.